What is St. John the Evangelist School’s mission and tradition? The mission of St. John the Evangelist School is to integrate Catholic philosophy and teaching with academic excellence. We believe that children become aware of their unique value as children of God and begin to identify and develop their talents during their elementary years. St. John the Evangelist School strives to develop our students’ academic abilities and Christian character, encouraging them to become responsible citizens who are interested in serving their local and global communities. As our motto states, we are committed to “Inspiring Hearts & Minds”. What is unique about Saint John the Evangelist Elementary School (SJE)? At St. John the Evangelist School, students are happy, safe, and academically challenged. Each student is welcomed, regardless of socio-economic, physical, or academic background. The faculty recognizes and encourages students to use their unique gifts in the service of others. Our service-learning projects are central to this teaching process and help develop and maintain a culture of respect for all life. As students progress through our school, they begin to understand and appreciate the contributions they can make to our school, parish, and community at large. We are a welcoming, caring community. Our sense of community and the importance of serving others, along with our award-winning academics, identify who we are. Our school community reaches out to others in many ways to make them feel welcome. Our parent mentoring program welcomes new parents into our school community. Our classroom buddy system (older students paired with students in the primary grades) forms a special bond among students. Parish volunteers for classroom tutoring, guest speakers, club moderators, after-care providers, and lunch-duty monitors add to the richness of our school community. What does the National Blue Ribbon designation really mean? On September 24, 2013, it was announced that St. John the Evangelist had been selected as a U.S. Department of Education National Blue Ribbon School. One of only fifty private schools in the nation to be given this designation in 2013, SJE was also one of only seven Maryland elementary schools, public or private, to win the honor as a “high-performing” school. That means that SJE was ranked among the highest performing schools in reading and math, with its students testing in the top 15% of all students, as measured by a nationally normed test, in the state in those areas. Public and private schools submit applications that discuss all aspects of a school’s “personality”: student academic achievement, school culture, extracurricular activities, and parent involvement. A particularly strong aspect of SJE’s application was our emphasis on building a culture of virtue and the vital sense of community that anyone who enters the school immediately understands. 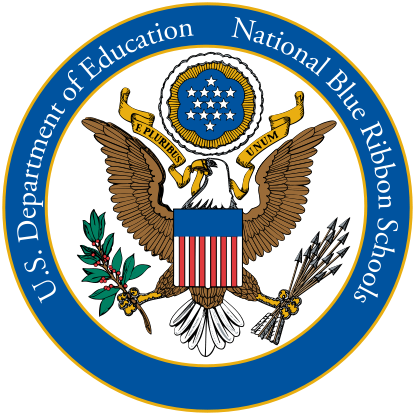 Once a school receives the Blue Ribbon designation, it is considered a National Blue Ribbon school and is not required to reapply. The year the school sought nomination must be listed, and schools can choose to reapply for the designation, but not before seven years. Since the awarding of the Blue Ribbon in 2013, SJE has continued to meet the Blue Ribbon Standards in Reading and Math in all applicable grades. Our scores are well above the national average in these areas. What can you tell us about SJE’s academic standards and curriculum? SJE has a Resource Program which is designed to serve, as far as possible, the children in our parish who have been diagnosed with learning and/or physical challenges. The educational plan and resource time advised through the professional evaluation will be incorporated by the resource teachers and classroom teachers as much as possible. Ordinarily, if there are other elementary school-aged siblings in the family, it is expected that they will attend our school as well. St. John the Evangelist School is accredited by the Southern Association of Colleges and Schools, a division of AdvancED. This partnership provides us with a demanding research-based process that incorporates strategic planning and Catholic standards into school accreditation. Accreditation is a rigorous process used to validate that schools in the Archdiocese of Washington uphold their Catholic identity, ensure high academic achievement, provide safe and nurturing learning environments, and work to continuously improve. St. John the Evangelist School’s faculty and parents work in conjunction with the school’s Advisory Board and administration to monitor and coordinate yearly reviews of the goals set during the reaccreditation process. Subcommittees continue to work toward increasing enrollment, improving facilities, increasing outreach, and, most importantly, ensuring the curriculum is rigorous and engaging. All of these strategies and efforts make the vision of a constantly improving St. John the Evangelist School come alive. Can you tell us more about the students and families attending SJE? SJE has approximately 145 families in the school. Over the past five years, our student body ranged between 203 – 210. Class size averages 20-22 students with a maximum of 30 students. About 84% of our population is Roman Catholic. In the 2016-2017 school year, the demographic composition by Race in our school was 59% White, 23% African and African-American, 4% Asian and Asian/American, 14% Mixed or Other. Diversity by Ethnicity was 88% non-Hispanic and 12% Hispanic. Our families are brand new to the school, have been here over 18 years, and are somewhere in between. Last year’s graduating class of 24 students had been students at St. John the Evangelist for a total of 178 years! Our student retention rate is 92%. Arrival time for students in Junior Kindergarten through Grade Eight is 7:50-8:05am. Students in K- 8 wait on the playground until the bell rings at 8:05am. (Junior Kindergarten students go directly to the classroom.) At that time, they form lines and enter the building by means of their classroom exterior doors or the doors at the end of the corridor. The school day begins at 8:05am and ends at 2:55pm. Before and after-care programs are available at additional cost, allowing full-time working families to drop off their children by 7:30am and pick their children up as late as 6:00pm each day. During the day for K-4, students have Mathematics, Reading, Religion, Science, and Social Studies. They have classes in Physical Education, Music, Spanish, Art, Library, and Computer Lab each week. They have morning snack and break time and afternoon recess each day. For grades 5-8, students are grouped into smaller groups for better-focused learning in Mathematics, Literature, Science Labs, Art, and Spanish. Spanish is offered twice a week so that students will be prepared for higher levels of Spanish in high school. Middle School students change classrooms and teachers for different subjects. On the First Friday of each month, grades K-8 attend Mass. Grades 1-8 take turns preparing for the liturgy. The class in charge for that month gives the opening welcome, reads the epistle, sings the refrain and the communion reflection song, and reads the petitions. On other Fridays of the month, classes attend Mass. There are days during the school year when students attend special assemblies—guest speakers, student appreciation day, field day, Student Council elections, Literary Day, History Day, talent show, band and spring concerts, etc. On these days, we have special schedules in the afternoons. Where is St. John the Evangelist School located? The school is located at 10201 Woodland Drive, Silver Spring, MD 20902, just north of I-495 and the Forest Glen Metro station. The school is bordered by a quiet neighborhood, but is also in a great location for parents commuting into the district, with Georgia Avenue and August Drive as the cross streets. Does St. John the Evangelist School offer an extended day program? St. John the Evangelist offers both before and after care programs at additional charges. Before school care begins at 7:30 am and after school care ends at 6:00 pm. St. John the Evangelist also offers after school programs, such as Art Horizons, Band, Scouting, and Science and Math Club. Does St. John the Evangelist School offer Financial Aid? Financial Aid is available to Kindergarten through Grade 8 applicants. Your application must be submitted through the Archdiocese of Washington Financial Aid process (TADS) and is used for determining both Archdiocesan and local monies for tuition assistance as they become available to St. John the Evangelist Parish and School. What extracurricular activities are offered at SJE? St. John the Evangelist Parish participates in Catholic Youth Organization (CYO) sponsored sports programs for Grades K-8 offering: soccer, basketball, baseball, softball, T-ball, and track. Children develop the athletic virtues of teamwork, self-discipline, good sportsmanship, and competitiveness in a positive, Catholic environment. Flyers will be sent home throughout the school year as each sport is preparing for its season. Some programs are in conjunction with other Archdiocesan schools’ CYO programs. St. John the Evangelist School offers some club and class activities after school. Not every activity is offered every quarter, but notices of these activities will be sent to parents. Where do St. John the Evangelist School students go upon graduation? What costs and commitments can I expect for my child to attend SJE? There is also a mandatory book/field trip/hot lunch fee of $400 per child in K-8. Tuition and fees are paid through TADS via automatic deductions. For parents with more than one child registered to attend SJE, the parish offers a sibling discount, which would be deducted from the tuition rate. Gently used uniforms are available for purchase at steep discount through the school’s Used Uniform Boutique. If families decide to enroll their students in before- or after-care programs, the costs are tabulated each month and bills are sent. The Before Care rate is $4 per half hour. After Care is $9 per hour. In order to meet the Home School Association’s (HSA) annual fundraising goal, we require each family to participate in whichever fundraising activities they choose in order to contribute a minimum of $370 per year. These funds are raised in an effort to keep tuition costs as low as possible. These fundraising activities, a percentage of which can go toward your obligation, will be outlined at the first HSA meeting of the year. In lieu of participating in these activities, you may make a donation of $370 per family. FAMILIES WITH 1-2 STUDENTS: 12 LUNCH-RECESS DAYS ARE REQUIRED; 6 DAYS ARE REQUIRED FOR SINGLE PARENT FAMILIES. FAMILIES WITH 3-4 STUDENTS: 15 LUNCH–RECESS DAYS ARE REQUIRED; 7 DAYS ARE REQUIRED FOR SINGLE PARENT FAMILIES. FAMILIES WITH 5 OR MORE STUDENTS: 18 LUNCH-RECESS DAYS ARE REQUIRED; 8 DAYS ARE REQUIRED FOR SINGLE PARENT FAMILIES.